Posted on February 7th, 2019 . 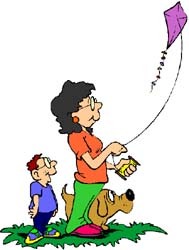 Today is Kite Flying Day, a great time to go fly a kite. People have enjoyed flying kites for thousands of years. It’s an ever-popular activity for children and enjoyed by many adults. Ben Franklin was perhaps the most well-known kite flyer. He flew a kite in a thunderstorm and discovered electricity. He got a charge out of flying kites! We are amazed that Kite Flying Day is held in the middle of winter. Chances are few people in the northern areas of the country will brave the snow and cold today to go outdoors and fly a kite. Did you know? Kites were first used by the military in ancient China over 3,000 years ago.